Will My Edit Require an XBRL Update? A common question we receive about XBRL is, “Will this small edit I’m about to make to my document require an XBRL update?” We typically get this question when there are only a few hours left before the filing deadline and it’s necessary to squeeze in a few more tweaks—a comma here, a typo there, a couple underlines on a table, etc. The short answer is: If the edit is in a section of your document that is tagged with XBRL, an update to the XBRL will be required, even for an edit as minor as adding a comma. It’s important to keep in mind that we are only talking about sections of the document that are tagged for XBRL: Financial Statements, Footnotes to Financial Statements, and Supporting Financial Schedules (e.g. Schedule II). In other words, if you need to make an edit to the F-pages, you’ll need an XBRL update. However, if you need to edit the MD&A, certification exhibits, or anything else outside the F-pages, you will not need an XBRL update. So let’s look at why this is so. We’ll give the basic explanation first and provide some more nuanced details as well. The first thing to keep in mind about edits that affect the Financial Statements & Footnotes to Financial Statements is that XBRL creation does not function like word processing. For reasons related to both version control & consistency and to the quality of the XBRL code, edits are not made directly to an existing XBRL document. Put another way, updating XBRL is not as simple as clicking in a paragraph and typing changes. Here’s the gist: During the filing process, RDG maintains one master HTML version of your document. From that master HTML file, we can create the EDGAR proof, and we can also pull that HTML into the XBRL tagging software to create an updated XBRL version. In this way, the content of the EDGAR document and the XBRL version always match exactly. So, when you submit a change to the F-Pages, we make that edit to the master HTML file in a way that is roughly analogous to word processing, and then we can send you the updated EDGAR proof generated from the revised master HTML file. However, we do not then go into the XBRL version of the document and re-make the same edits. To update the XBRL, even for the smallest changes, the master HTML file must be re-uploaded to the XBRL tagging software. Because XBRL creation is complex, once the new master HTML file is uploaded, even the smallest of edits must be reviewed and re-validated to ensure the finished product is ready to be submitted to the SEC. This is why even a single comma can take considerably longer to update than expected. 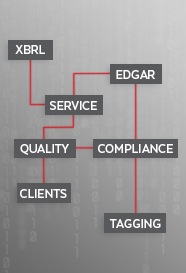 Looking at the image above, the nitty-gritty of XBRL tagging is mostly found in the sections of the SEC rendering called “Financial Statements” and “Notes Details.” In those sections, all you see is a list of tagged values and their attributes, but you do not see any of the text from which those values are pulled. The three sections in-between are very different, because there, you will not simply find individual tagged values, but the entire note, table, or policy from your HTML document. These sections are tagged as a block (called a “Text Block”). When a Footnote to the Financial Statements is block-tagged, you see the entire note exactly as it’s formatted in your HTML document, down to every comma. If you were to add a comma in the note above, an XBRL update would be necessary. The added comma would not affect the “Notes Details” section where only the values are presented. However, without an update, the added comma would not appear in any of the text block sections and the XBRL would not exactly match the HTML document. The same goes for any changes to tables, no matter how small the change. RDG will, as always, make every effort to get all necessary changes done as expeditiously as possible. We hope this information helps to make clear why even the smallest change to the Financial Statements & Footnotes is a challenge, especially during the time-crunch on deadline day, and can require more time to process than you might anticipate.